The moon can guide you to Cancer the Crab tonight – if you are patient. You have probably heard of the constellation Cancer, but there is a good chance you have never seen it. As constellations go, Cancer the Crab is probably the most famous constellation that the fewest people can actually identify in the night sky. Its primary competitors in the famous-but-not-recognizable category are probably Aries the Ram and Aquarius the Water Bearer. Why is Cancer so tough to see in the night sky? Simply because it is faint. Cancer’s brightest star is magnitude 3.5, meaning that none of these stars is visible from light-polluted cities or suburbs. That is why tonight may be your night. 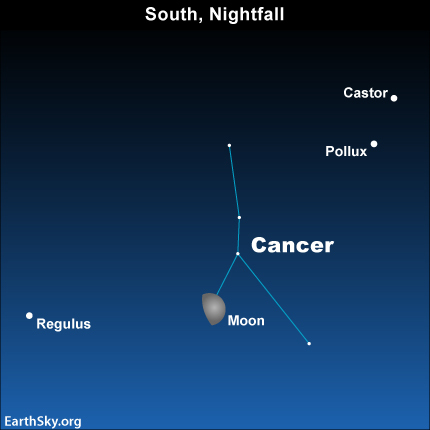 The waxing gibbous moon is in front of this famous constellation this evening, so when you gaze in the moon’s direction you are gazing toward Cancer. Alas, the moon is very bright, and Cancer is faint. Even if you have a dark sky, the bright light of the moon will wash out this constellation’s stars from view. However, before you give up on your quest to see Cancer, consider this. The stars don’t move relative to each other. That fact might enable you to locate the constellation Cancer later this month, assuming you are standing under a dark sky. Here is how to do it. Look for the stars around tonight’s moon. Tonight, you will see the two bright Gemini stars, Castor and Pollux, to the right of the moon, and the bright star Regulus to the left. Later this month, the moon will have dropped out of the evening sky, and you will be able to identify Cancer glimmering between Regulus and the two bright Gemini stars. If you have binoculars, you will see something more: a cluster of stars within Cancer, called the Beehive. Cancer is well known, not because it is bright, but because the sun in its yearly journey passes directly in front of it from about July 20 to August 9. Therefore, by definition, faint as it is, Cancer is a constellation of the Zodiac. Use the moon to identify stars near Cancer tonight. Then come back to this part of the sky when the moon has passed on.